Student tickets are just $5! - Arts & Culture Texas"
Miyamoto is Black Enough exercises spirited conversation and debate through steelpan, cello, text, and voice. Cellist Jeffrey Zeigler, of Kronos Quartet, teams up with composer and percussionist Andy Akiho, poet Roger Bonair-Agard, and percussionist Sean Dixon for a work-in-progress program of spoken word and music, both complex and aggressive. 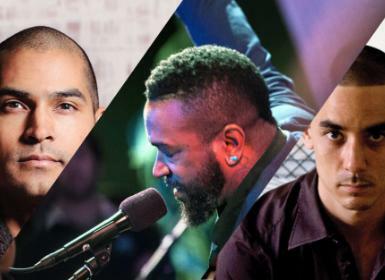 Slam poetry meets new music in this electrifying and thought-provoking program of music and words presented by three spectacular contemporary performers.